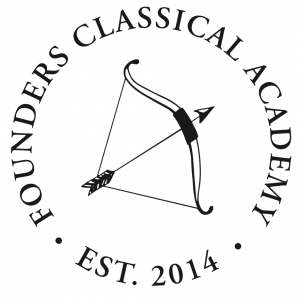 At Founders Classical Academy, students begin studying Latin and Greek root words in 3rd grade, and when they get to 6th grade they begin Wheelock’s Latin. Over the course of 6th and 7th grade, students complete Latin I and are ready to go on to more advanced Latin in 8th grade and high school. Learning Latin is a new experience for students who have never had it before, but the benefits of studying this ancient language are hard to overstate. Here is a glimpse inside a 6th grade Latin classroom. Latin can be a difficult language to learn, because it is generally written, not spoken, and because it is inflected. An inflected language is one where nouns and verbs change their meaning when prefixes and suffixes are attached to them. In English (which is not an inflected language) we don’t usually have to make big changes to verbs to use them in a sentence, but in Latin, we do. This is called conjugating. For example, one of the first verbs a student learns in Wheelock is to hear. In English, it’s pretty easy to use that verb in the present tense: I hear, you hear, we hear, they hear. It’s all the same word over and over again. The only change that’s needed is to the third person singular, and that change is pretty simple: just add an -s to get she hears, he hears. In Latin, students learn to change the ending of the verb depending on who is doing the hearing: audiō (I hear), audīs (you hear), audit (he or she hears), audī́mus (we hear), audī́tis (you all/y’all hear), audiunt (they hear). In English, we use the same word for gate no matter what function it’s performing in the sentence. Whether we want to say “The gate is locked,” “I opened the gate for him,” or “The sign was posted on the gate,” we always use the same word–gate. In the first sentence gate is the subject, in the second it’s the direct object, and in the third it’s the indirect object. Because we always use the same word for each of these functions, it’s sometimes difficult for students who only know English grammar to identify the different things a noun might do within a sentence. In the first semester of studying Latin, students have to get their minds around a whole new way of thinking about grammar. Latin works very differently: besides the fact that it’s inflected, the syntax of Latin sentences is different than it is in English. In English, we use the order of words to convey meaning. For example, “Mrs. Panzica tossed the pencil to the 6th grader” is a very different sentence than “The 6th grader tossed the pencil to Mrs. Panzica,” and “Mrs. Panzica tossed the 6th grader to the pencil” is complete nonsense. In English, changing the order of the nouns changes the meaning of the sentence completely. But in Latin, the word order is much more flexible, and the meaning of nouns is conveyed by the endings that are attached to them. Learning Latin requires memorizing all of the endings that can be attached to a noun to convey what job it’s doing in the sentence; whether it’s the subject, the direct object, the indirect object, and so on. It’s a lot of memorization at first, but in 6th grade we use games and competition to keep it engaging. Mrs. Panzica’s 6th graders were so proud of themselves for memorizing the first and second declensions that they invited me to come and watch them recite in class. Just look at their faces! Students of Latin tend to be better students overall, because the precision and focus that Latin requires is useful for thinking in all subjects. Not only that, but Latin teaches students to be more thoughtful about English grammar, and verbal and written communication in general. This understanding fosters both clarity of thought and expression. Because the English language has roots in the Latin language, students learn the etymological history of many English words, including words we use every day. Some phrases we easily recognize, such as those in our sciences (homo sapiens), in our Constitution (habeas corpus, ex post facto) and in more familiar expressions such as A.D, i.e., and e.g. Knowing etymology allows students to develop a larger vocabulary and makes them quicker to discern the meaning of unfamiliar words. The Western tradition has roots in Roman civilization, so the study of Latin allows students greater access to this important source and teaches us who are are as the descendents of the Romans. I think the Greeks & Romans have left us the present models which exist of fine composition…I know of no composition of any other ancient people, which merits the least regard as a model for its matter or style. To all this I add, that to read the Latin & Greek authors in their original, is a sublime luxury…. I thank on my knees, him who directed my early education, for having put into my possession this rich source of delight; and I would not exchange it for anything which I could then have acquired, & have not since acquired. According to Jefferson, reading Latin teaches us about good writing, which nourishes the mind and teaches one to love what is well-ordered and beautiful. Our curriculum requires students to study Latin I, Latin II, and Latin III. Students typically complete Latin III at the end of 9th grade, and from there they may go on to study advanced Latin or another language in the high school. Stay tuned for some tips for helping your Latin student from home. There is a wealth of resources out there, and our Latin teachers have a few recommendations to share.